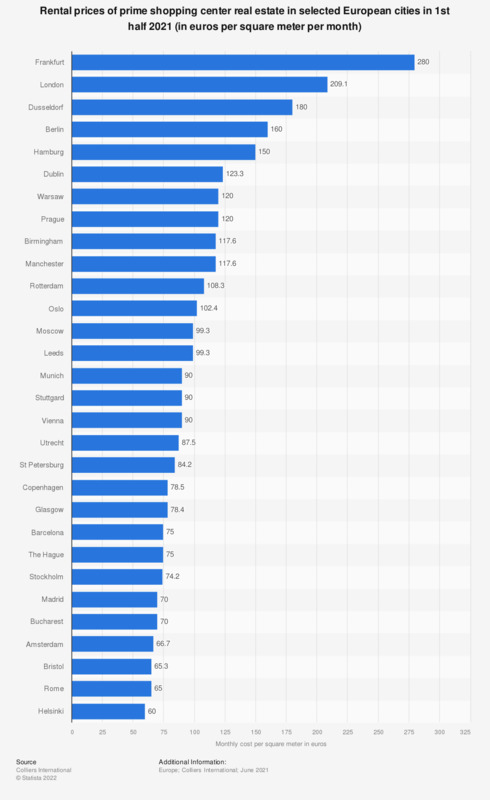 The statistic displays the rental prices for shopping centers in prime locations in selected leading European cities as of the third quarter 2018, expressed in euros per square meter annually. Prime locations for shopping centers include main streets and city centers of the European cities, and factors such as the main flow of customers, amount of space to handle the sales volume expected, as well as the direct competition and neighbors all have a great impact on projected sales. Specifically, the space requirements have to be carefully tailored to the usage requirements, as rents typically prove to be high. According to the data presented, the most expensive retail space in shopping centers were rented out in London where prices were on average just under six thousand euros per square meter per year (zoned/weighted figure) as of the third quarter 2018. * Shopping Centre rents are based on prime covered shopping malls, quoted on best position, 100 sq m units. Everything On "Shopping centers in the United Kingdom (UK)" in One Document: Edited and Divided into Handy Chapters. Including Detailed References.